Shitamichi Motoyuki (born 1978, Okayama, lives in Nagoya) is a ‘traveling’ artist, known for his interest in borders. In the course of his wanderings, drifting from place to place without a specific destination, he accumulates objects that he stumbles upon, often relating to symbolic sites of exchange, or he photographs examples of hidden border crossings, such as the derelict remains of torii (shrine gates), encountered in foreign lands once occupied by Japan, or the Remnants of wartime bunkers, scattered around the islands’ coastline. In the Bridge project, Motoyuki took photographs of everyday ad hoc structures, such as a plank of wood, a concrete slab or even an upturned skateboard, that people had improvised into bridges so as to cross day-to-day boundaries, such as a ditch or a gap in the footpath. 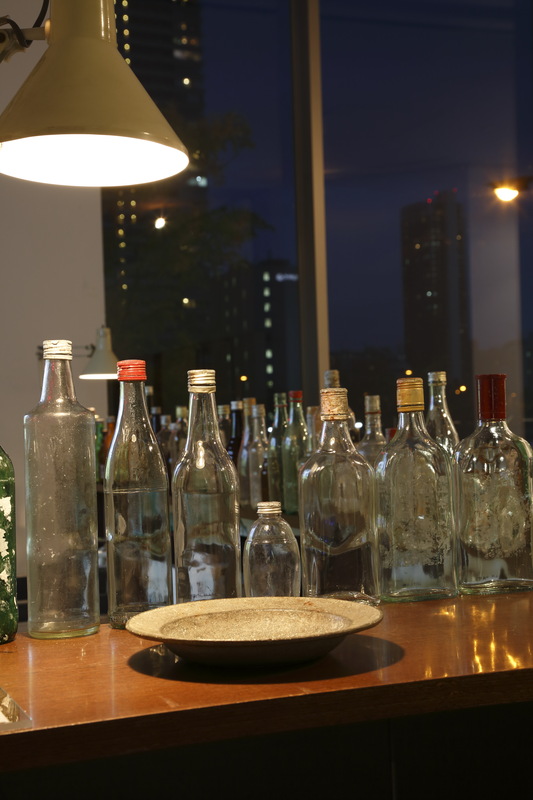 For the Dojima River Biennale, he created a number of new projects in relation to the idea of borders, and transformation, under the umbrella title of Floating Monuments, exploring the concept of “drifting/staying”, and the notion that “things that look solid are in fact liquid”. 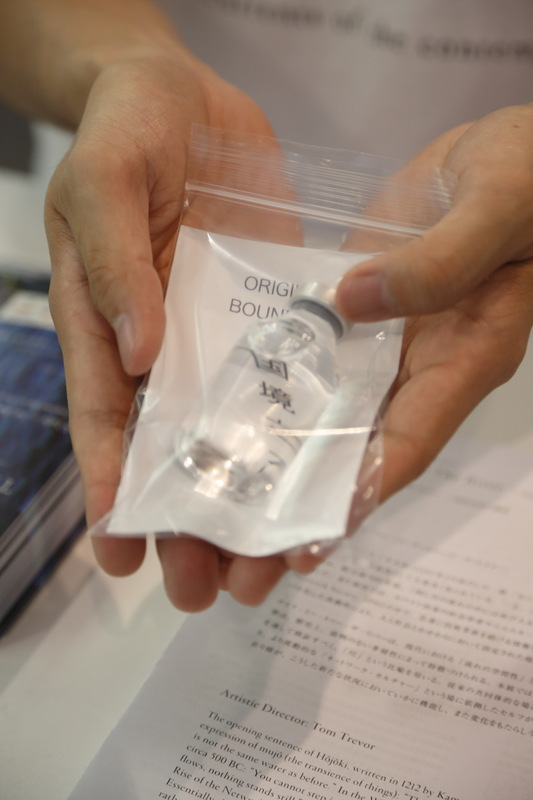 For the work, Original Boundary, the artist used samples of seawater, scooped up from the disputed ocean border between Japan and Taiwan from the side of a fishing boat, which he then sold in the Biennale shop, in small bottles, as a limited edition of 100. 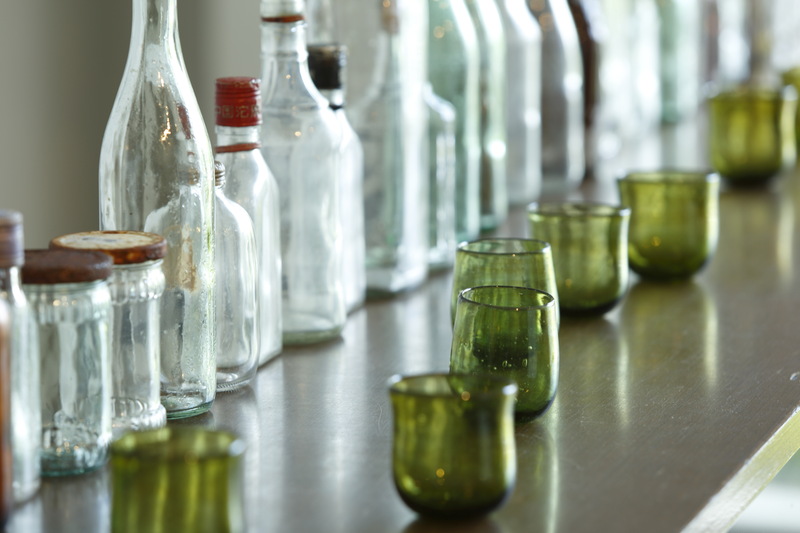 He also presented an installation of new works made on the Japanese island of Okinawa (a major base for the US military, since WWII), entitled Okinawan Glasses, using glass bottles swept ashore from across the Pacific Ocean by the Kuroshio current, out of which he crafted a range of recycled Ryukyu glassware. Alongside this he placed a ‘duralumin’ plate, found in an Okinawan thrift store, made from the recycled metal of WWII fighter planes (still bearing the ‘Watertown’ stamp of the original US plate that was used to cast it). 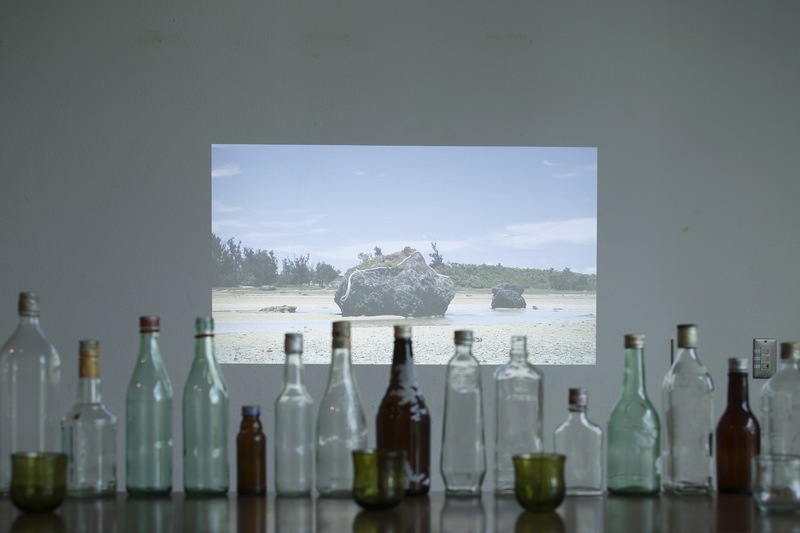 Behind this display of battered bottles, recycled metalware and beautifully flawed glasses, arranged along the counter of a shiny bar, Motoyuki projected a video, Tsunami Rocks, showing the artist gathering up these washed-up bottles from the beaches of Okinawa, whilst wandering amongst the giant boulders deposited on the island during a tsunami that took place 240 years earlier. Motoyuki’s poetics of ‘drift’ problematizes our assumptions about borderlines, values and exchange. How do you find a value for a particular sample of seawater, from a particular place, that challenges its generality as just ‘seawater’? Is the water more valuable because it derives from the disputed borderline between two rival nations? Or because it has been presented for our attention by an artist? In the imaginary process of valuation, what does it mean to attach the flotsam and jetsam of time to particular narratives of history in order to invest them with significance? 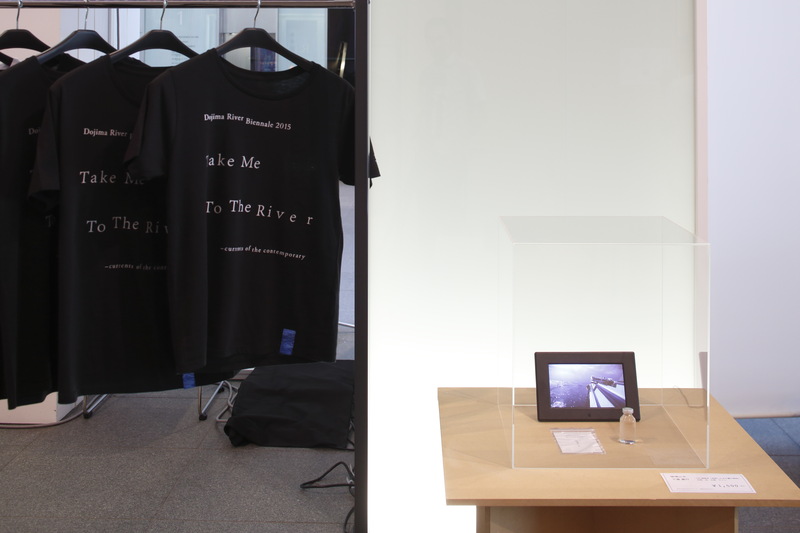 This entry was posted in Projects, Writings and tagged Dojima River Biennale 2015, Shitamichi Motoyuki. Bookmark the permalink.